Have you ever grown potatoes? Or Jerusalem artichokes? Or oca? If so, it’s likely that you still are! Unless you are VERY thorough in harvesting, there are always a few tubers left behind that manage to grow again next year. At this rate, I think we will probably have potatoes and oca growing in every bed of our garden in the next few years… we don’t like Jerusalem artichokes*, so they are absent. Such unplanned plants are often referred to as ‘volunteers’ and they can be a real bonus. Of course, in a meticulously planned garden you might not want to have a squash plant rampaging across your flower beds or garlic interfering with bean production (apparently legumes do not grow so well in the presence of members of the onion family), but they can also be an unexpected treat. 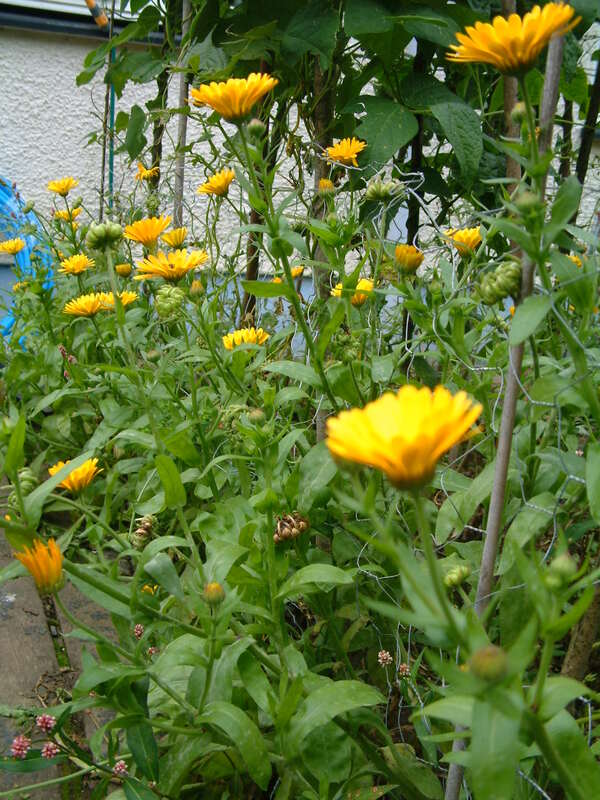 I always allow the self-sown pot marigolds (Calendula) to establish as they attract beneficial insects, particularly hoverflies. When clearing beds after one crop we regularly come across potatoes and if we don’t find them the chickens often dig them up… providing us with an unplanned meal or two. Potatoes also appear from the compost heap – frequently at unexpected times of the year because of the warm conditions. These must originate from peelings and are always welcome. One year we even got volunteer carrots between the paving stones… I have no idea how this happened as I NEVER grow carrots! 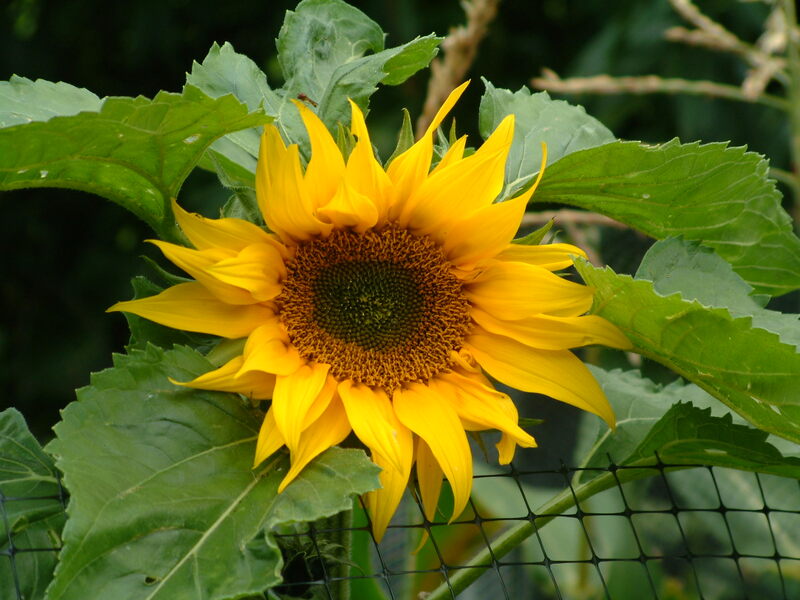 Perhaps my favourite volunteer this year is a sunflower derived from the bird seed. I have never grown sunflowers in our current garden, so its appearance has been an unexpected pleasure and it is currently attracting lots of insects – particularly bees. A second one has also appeared. Both are in the squash bed and have been joined by several brassicas… not sure what, but we’re eating the leaves like kale (they’re always edible that way). Often, volunteers are vigorous plants; after all, they are growing in a place that must be suitable for them otherwise they wouldn’t have survived there. 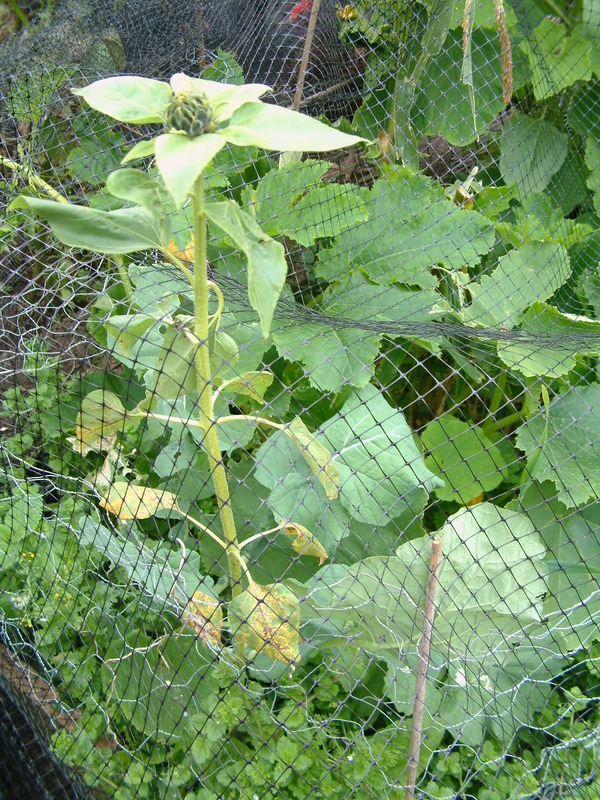 If you find such plants at an early stage and you really don’t want them where they are growing, you can always transplant them – tomatoes and squashes really don’t seem to mind too much being moved and you can minimise disturbance by taking a good root ball with you. But my inclination is, where possible, to leave them… it adds to the diversity of beds and prevents the garden becoming too regimented. I love the idea of plants thriving in the right place for them, like in a natural ecosystem, even though I know that I really do have to exert some control! * It may interest you to know that Jerusalem artichokes are being used as a biofuel crop because they are so easy to propagate, grow on land unsuitable for many other crops and produce so much biomass (the average fresh tuber biomass is estimated to be 45-90 tonnes per hectare – thanks to the Molecular Ecology Group at Lanzhou University, China for this information). Mr Snail-of-happiness is delighted about this alternative use, as he hates the taste of them with a passion! Great blog about volunteer plants. I have many plants that have self seeded, and therefore never have to worry about planting again. Potatoes- we plant a different variety so the following year we have a nice mix of last years potatoes with new varieties. Tomatillos: I will never have to buy one again, they pop up like crazy, almost like a weed. Borage: I planted this for the bees. They LOVE it. Now it pops up in the spring and we let it grow as long as it’s not by something else we want more. Arugula: comes up everywhere now. In the garden path! Gotta love a self propagating garden. Thank you. I like seed saving, but natural self-seeding is even better! Fantastic, especially the sunflowers. We had volunteer tomatoes this year – in the middle of a pot of basil and via our compost I think. Not a good year for tomatoes though and they’re mostly still small and green, nice surprise though. I’m really chuffed with the sunflowers… and encouraged to actually plant some next year – at least for the birds and bees. Our tomatoes have been rubbish this year… maybe next time! Brilliant – what abundance and diversity! I’ve never had volunteer legumes myself. Sometimes it’s great to let nature take its course… but without management we’d all be swamped by one or two things… in my case lemon balm because the chickens don’t eat it, unlike almost everything else. Volunteers a-plenty on our allotment – fascinating to find that Jerusalem artichokes are becoming a biomass fuel, but logical, can’t stop the blighters and they grow so quickly! Yup, once you’ve planted them, you’ve got them forever! The research I have read is from China, but I’m guessing other countries are considering it too.